Today I upgrade strait off of 8.10 via the update manager, it went off without a hitch. All my settings stayed put, some of my apps got an upgrade too. The most noticable changes were in the boot UI and the login UI. Hopefully Ill be able to make a custom CD of this distro to install on my other computers. See you soon. Just like to say that, its out and ill keep you updated on the results of my install. I'll be upgrading off of 8.10, but i will be grabbing the ISO file for other machines. Hey all, it's been a LONG time since my last post. Well I haven't had a chance to post because of numerous things like system failure, reinstallation, the loss of my entire folder of system disks, and the upgrade to ubuntu linux. Anyways, I've grown to like it a lot, more than windows actually, since you can do mostly the same things with ubuntu/linux that you can do with windows. You can probably do even more, but alas I am still a n00b when it comes to linux. The best thing about linux is that ubuntu is only one of the many versions that are out there and they are all FREE to download, share, and use! almost all software for linux is also free. And even better is that it can run on almost any platform, i.e. PC/Mac machines, and requires very little in resources, i.e. 256mb RAM minimum. The thing that turns most people away from linux is the fact that sometimes to install said software you must use the Terminal, or linux's version of the Command Prompt. But once again you really only need a few days and it'll become quite easy, and if you have any trouble the linux community is very friendlty and quite helpfull. So I urge you to check out ubuntu for yourself, give it a try, and tell you friends!! F.E.A.R. 2: Project Origin hit shelves February 10, 2009, and hit steam the night before. With the size of 11 gigabytes on the PC I opted for the XBOX 360 version. The previous F.E.A.R. games, F.E.A.R., Extraction Point, and Perseus Mandate, were great, and scary, games, and the new F.E.A.R. carries on that fear factor. So far as I've played the biggest improvement has been the graphics, and the fact that not everyone has died in the first 5 minutes of play, though you're once again left alone to find your own way. Monolith has added a few new weapons to the game including new grenade types and a flamethrower. This time you play as a foot soldier dropped into the city right before the reactor is detonated in the first F.E.A.R. game. I haven't yet played the multiplayer part of the game, though i have in the original game. I've only had the game for a day now so hopefully ill be able to play in the next few days. In terms of XBOX 360 achievements, you have your standard 15 pts per level completion, 15-100 pts for the ranked matches online, and achievments for the different ways to kill badies. Check back later for updates on the online player aspect of F.E.A.R. 2: Project Origin. I recently upgraded from my TracFone to a Virgin Mobile TNT. It's a nice little flip phone that only cost me $20. It came in blue and is coated in "soft touch" material. It's a lot nicer compaired to my TracFone. Here's the TNT. For plans Virgin Mobile offers quite a few features. For instance if you sign up for their monthly plans you get things like unlimited mobile to mobile, texting and nights and weekends, which range from $25 - $80 per month. Or you can opt for the pay-as-you-go plans which only require that you add some sort of minute pack every 3 months. You minute packs only last for 30 days and then expire unless you add more in that 30 day time period, in which case your minutes will rollover. Minute cards, or "Top-Up" cards as Virgin Mobile calls them range from $20 - $100, and the more you spend the better deal you get. That is to say you pay less per minute while you talk. Texting and web browsing does cost extra though, but not much, its $0.15 per text and $0.15 per day for web browsing. The only real downside i found with this phone is that you can't connect it via USB to you computer and download custom ringtones. You are only allowed the tones that come with the phone and the ones that are purchased though Virgin's network. It's my Birthday! HOORAY! Dinner and a Concert!! 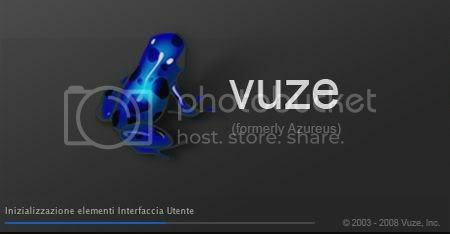 For those of you who don't know Vuze is a BitTorrent Client with a search engine and network built right into the GUI. The Vuze HD Network is marketplace of sorts where you can download the latest HD movie trailers, TV spots and other short videos. You can even publish your own material to the Vuze Network, though it has to be YOUR content otherwise it will be band and could get your account banded as a result. You dont have to have an account nesesarily, only to publish your content, you can still access the network without one. The nice thing about Vuze is that it gives you all kinds of details about the things you are downloading. Vuze also has a totally customizable search enginge to work with too. It comes stock with Vuze search and you can add other search engines like The Pirate Bay and ISOHunt. The only things i find bad about Vuze is that you MUST manually shut it down and that its search engine reports Peers/Seeds wrong. Check it out here and download it for free.